You know what’s fun? Enjoying great music with friends. You know what’s better? Bringing that party outdoors and adding in an interesting mix of strangers. If you have yet to enjoy an outdoor music festival in San Francisco, I suggest you get on it, pronto. 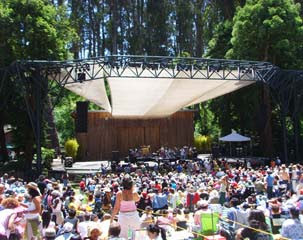 One festival to put on the list is Stern Grove Music Festival, they’ve been keeping the party going for over 70 years. On Sundays, from July to August, they bring a variety of performers to Stern Grove Park at 19th Ave. and Sloat Blvd. Oh and did I mention that it’s BYOB and completely free? Now I will say that I recommend bringing a few bucks with you every week because Stern Grove relies on donations to make all this happen, plus there’s food and drank for sale at the park. I will admit that Stern Grove is a fickle lover so you’ll have to work for her affection. Every year, it seems that people arrive earlier and earlier just to get a good spot. My first time I arrived around 1:30pm which made perfect sense to my friend and I considering the show starts around 2pm. Oh not so. Because we only arrived 30 minutes early, we were corralled into an overflow section with other late-comers. We could hear the music loud and clear, but our view was completely obstructed by the annoyingly tall yet glorious redwood trees. Year number two we stepped our game up and tried to arrive around 11am, each time we were able to secure a nice little spot close to the stage. Year three we were done messing around and got to the park at 10am and practically had the place to ourselves for the first couple hours, sweet victory. Year four and we're still battling the early birds -- even a 10:30 arrival meant that we had to sit on cement steps for hours on end. In addition to finding baller seats, the benefit of an early arrival is listening to sound check, a nice little appetizer to any music meal. The extra work to beat the crowd is definitely worth the reward (and expensive cab ride), and no matter where you’re seated the people watching is unbelievable. You have the uninhibited toddlers who will dance up a storm, the grabby couple enjoying their public make-out session, and don't forget the group of giggly older women who are plenty festive thanks to a healthy dose of wine for breakfast. I don’t know about you, but in my world, four years is a commitment and in my four years attending Stern Grove I have never been disappointed by this party in the park. Long live the outdoor music festival!